What Is the Difference Between Canola Oil & Safflower Oil? Cynthia Myers is the author of numerous novels and her nonfiction work has appeared in publications ranging from "Historic Traveler" to "Texas Highways" to "Medical Practice Management." She has a degree in economics from Sam Houston State University. Too much fat in your diet can contribute to heart disease, obesity and other health problems. But your body needs some fat to function properly. Fat makes food taste good, slows digestion and carries fat-soluble vitamins. Vegetable oils such as canola oil and safflower oil can be a beneficial part of a healthy diet. Use these oils instead of lard or butter in baking, cooking and making salad dressings. Each oil conveys similar health benefits. Canola oil is pressed from rapeseed, a plant in the cruciferae family related to cabbage and broccoli. Wild rapeseed contains high levels of erucic acid, which can be toxic. 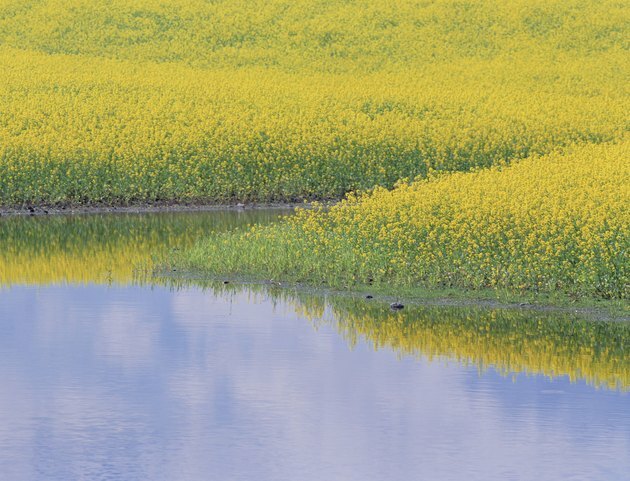 But the rapeseed used for modern canola oil is a hybrid that contains less than 1 percent erucic acid. Canola oil is a polyunsaturated fat that contains beneficial omega-3 and omega-6 fatty acids, as well as vitamin K. Purchase canola oil for cooking and for salad dressings. Use canola oil margarine in baked goods. Safflower oil comes from safflower plants, a relative of sunflowers. Like canola oil, safflower oil is a polyunsaturated fat that contains essential fatty acids necessary for good health. Researchers at the Department of Human Nutrition at Ohio State University reported in 2011 that obese diabetic women who supplemented their diets with as little as 1 2/3 tsp. safflower oil for 16 weeks realized lower blood sugar, higher HDL cholesterol levels and decreased inflammation. Your body needs essential fatty acids to function, but cannot manufacture them on its own. Two important essential fatty acids are omega-6, also known as linoleic acid, and omega-3, or alpha-linolenic acid. Safflower oil contains 10.15 g of omega-6 per tablespoon, while canola oil has 2.68 g of omega-6 and 1.28 gr of omega-3 per tablespoon. Both omega-6 and omega-3 fatty acids boost immune function and increase vascular health. Other sources of omega-6 include soybeans and sunflower seeds, while many fish and nuts contain omega-6. You need both essential fatty acids in your diet, so consuming more vegetable oils such as safflower and canola can help you get them. Cooking oils deteriorate when heated past their smoke point. Cooking oils with higher smoke points are better for deep frying, which requires heating the oil to 190 degrees Celsius. Safflower oil has a high smoke point, at 265 degrees Celsius, while canola oil's smoke point is 238 degrees Celsius.